The Denver International Airport is rolling out brand new technology at one of its security lines on the north end. DENVER — The Denver International Airport is rolling out brand new technology at one of its security lines on the north end. Called Enhanced Advanced Imaging Technology (eAIT), this technology will provide better security screening while moving passengers through lines faster. DIA is the first airport in the country to test the next generation of this technology. A similar screening system was tested at Los Angeles International Airport in the spring. “We are the only airport in the nation with this new technology and we are extremely proud and passionate about the experience,” said Larry Nau, TSA Federal Security Director. There are two big changes passengers will notice. First, they will not go into a confined screening unit. Instead, there are two walls the passengers will walk between and then pause. The other big change is that passengers won’t have to put their hands above their heads in this security screening. “For the travelers that have a difficult time raising their arms over their heads, this new technology is much easier to navigate,” Nau said. Passengers may not notice some of the other differences in the screening. TSA agents will be able to look at three screens as travelers pass through security instead of the one-screen technology employees currently use. The new screens will shorten wait times by a few seconds per passenger. Nau said that will make a big difference at DIA, where 70,000 travelers move through the airport each day. For now, travelers won't see a difference for what they need to remove — like shoes or coats — when they go through security. But that could change in the future. As for the radiation the machine emits, Nau said it’s the same as current technology and it’s safe for the public, including children, to use. “Actually, your cell phones emit more radiation or harmful things than this technology will,” Nau said. 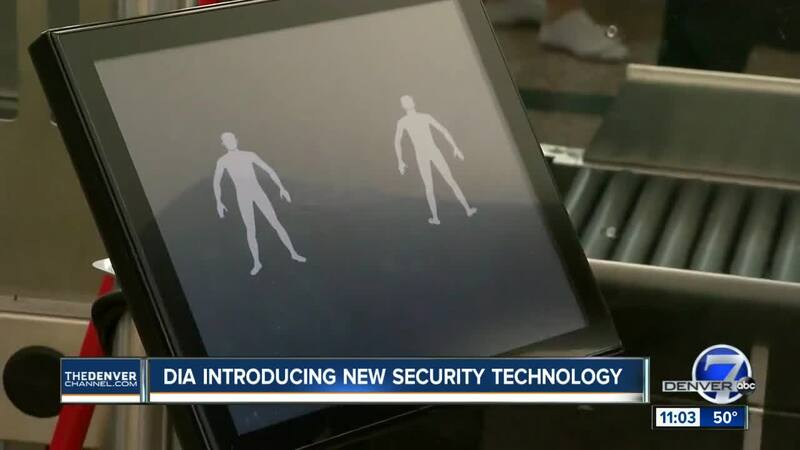 DIA and TSA officials wouldn’t comment on the cost of this screening technology, but said an independent party is in the process of evaluating it over the next few months to see how it performs. They will be looking at passenger feedback, the number of tests performed and outcome as well as the speed and ease of the technology. If the test is successful, DIA hopes to roll out eAIT systems at all of its screening lines by 2021.